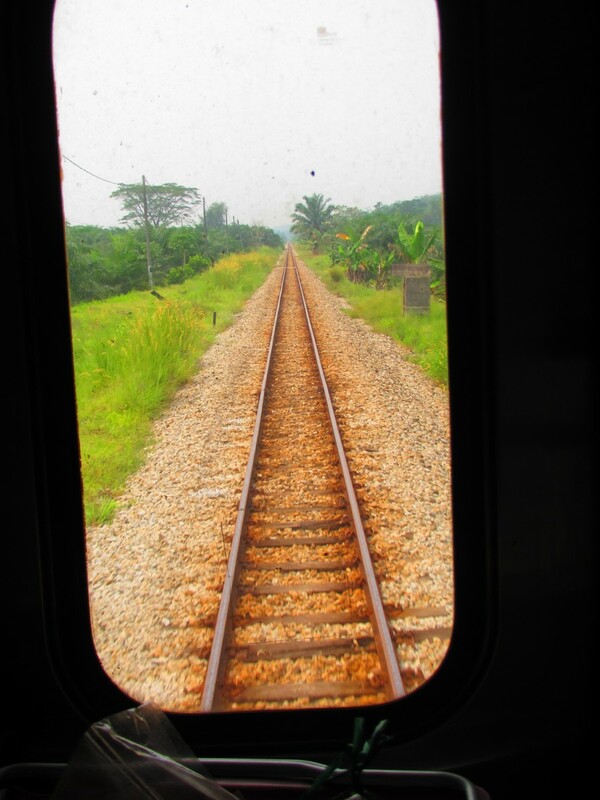 The train is a very viable transport choice between Kuala Lumpur and Penang. 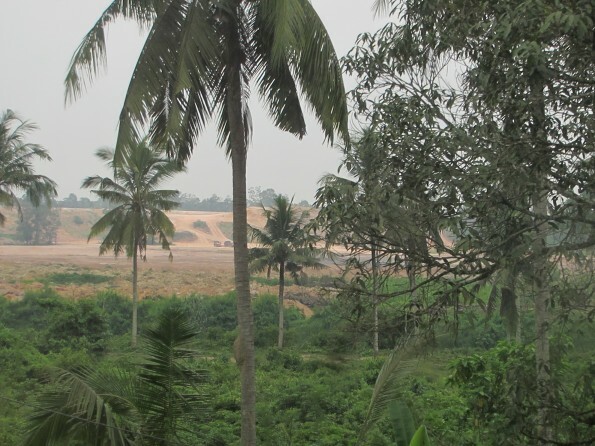 Or see the official KTM web site, which is more difficult to use: KTM – train company web site – note that for purposes of the web site your point of origin is Butterworth, and destination is Sentral Kuala Lumpur. Basically there are several trains a day in both directions, and the ticket prices as of this writing are RM59 or RM79, depending on which train you take. The train is one class. 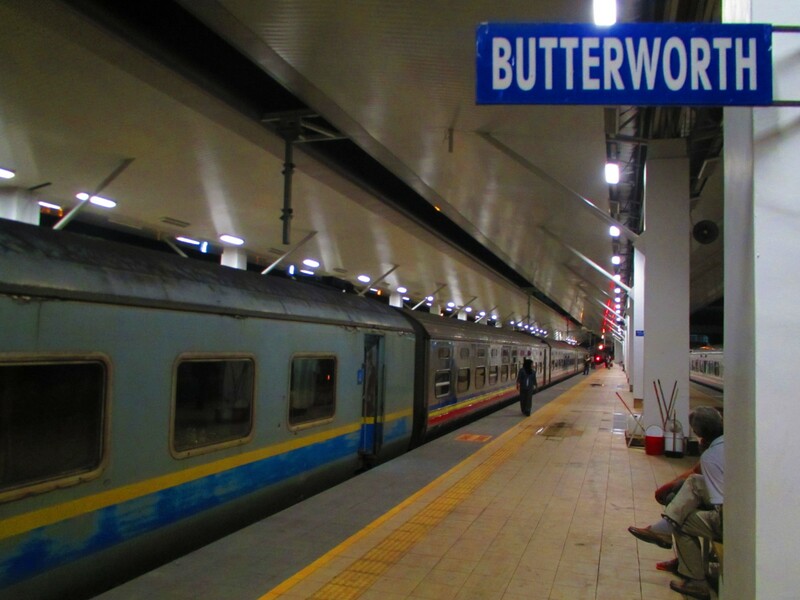 This blog describes the journey from George Town to Butterworth, where the train station is located, and then on to KL by train. after alighting from a taxi or bus you walk along a passage towards the sea and the KTM office, where you can buy a train ticket if you wish. Once you disembark from the ferry you walk straight ahead and then veer right, heading for both the bus station and train station. … and then to the right for the train station, or straight still for the bus station. It’s very easy to find. There is a lift that takes you up to the ticket offices and waiting area. The station is bigger now, but it is very hot inside. You aren’t allowed access to the platforms until the train has arrived and passengers have disembarked. In my case we were allowed onto the train about 10 minutes before the train was due to depart. 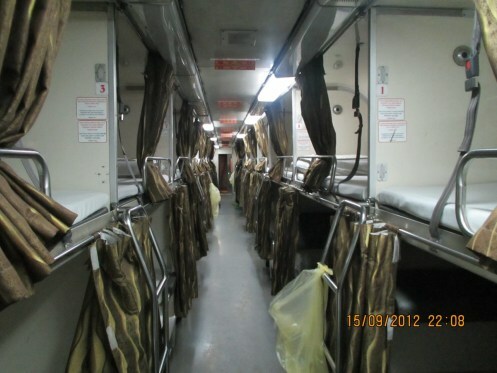 The carriages and seats are clearly marked, so finding one’s seat is easy. 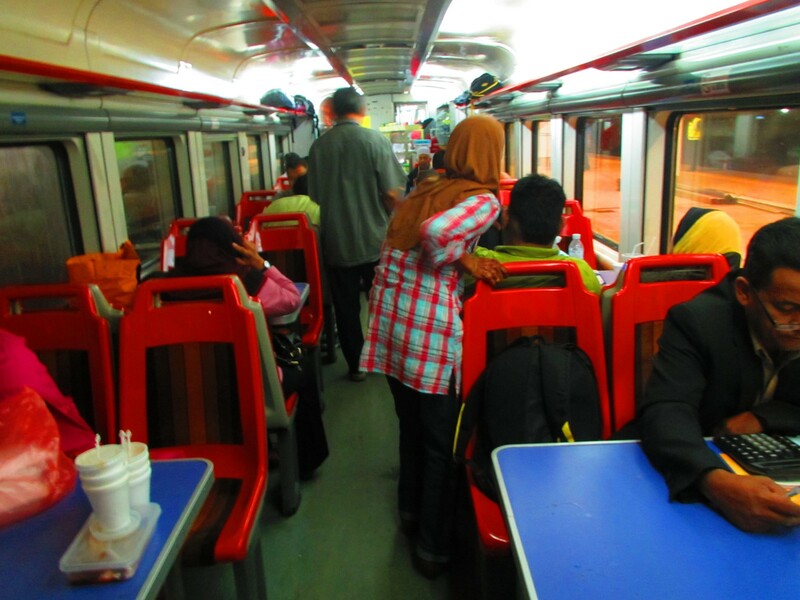 The train departed on time, and arrived in KL on time. There is a small café taking part of one of the carriages, with just few tables. You can buy coffee, teas, soft drinks, and a few light meals. The coffee was ok. The noodles I ordered were not very good. 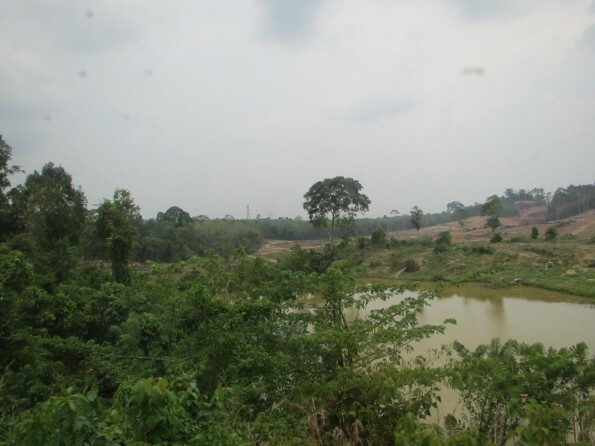 The scenery is pleasant enough, but quite similar to the same trip by road. There are clean toilets in a couple of the carriages. LCD displays show progress, the next station and the speed of the train, which reaches about 140kph. And as I mentioned above, the train arrived on time. 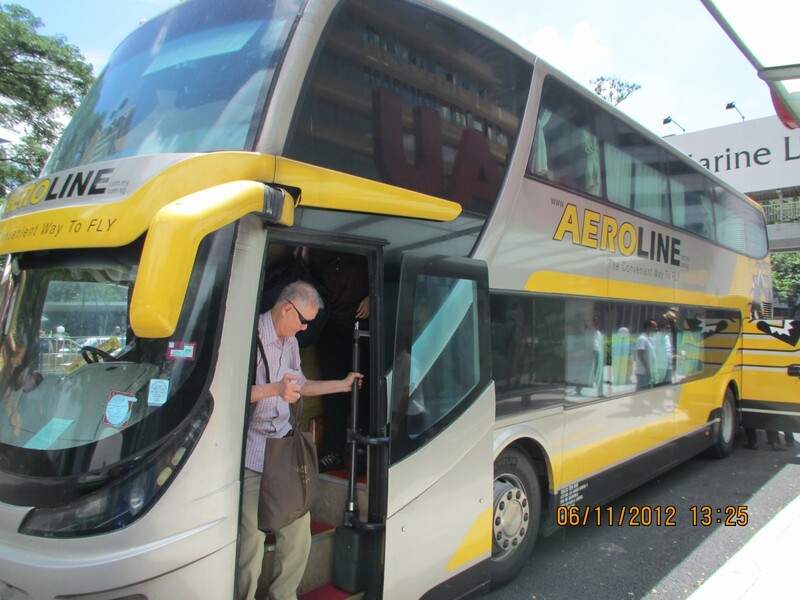 Of the three choices of public transport to KL, which is better? If you want to see the scenery, then surface transport. But really, once is enough. 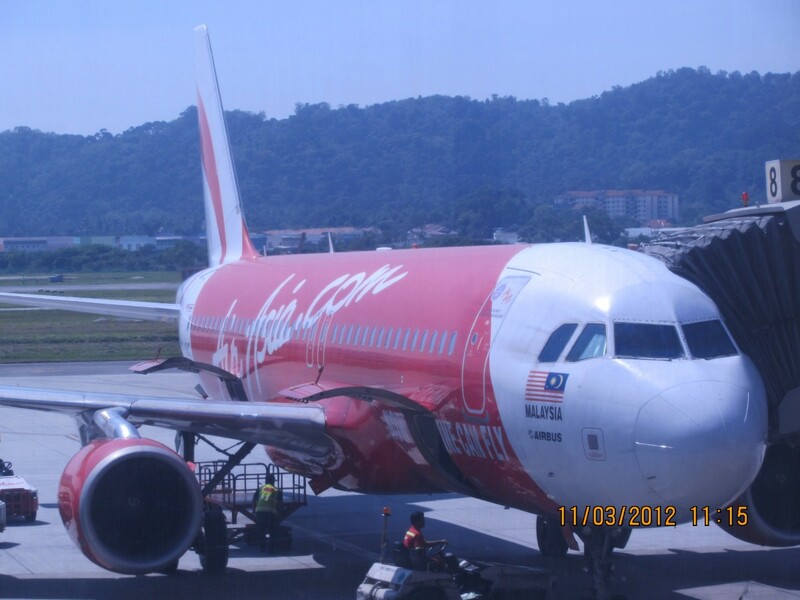 The airfare can be a similar price to the train or bus, especially if you factor in the cost from KL Sentral station or the bus station to the airport, if you are flying out of KLIA. So I tend to think flying is better if you’re going to the airport. From Penang to central KL all three modes take around the same time. 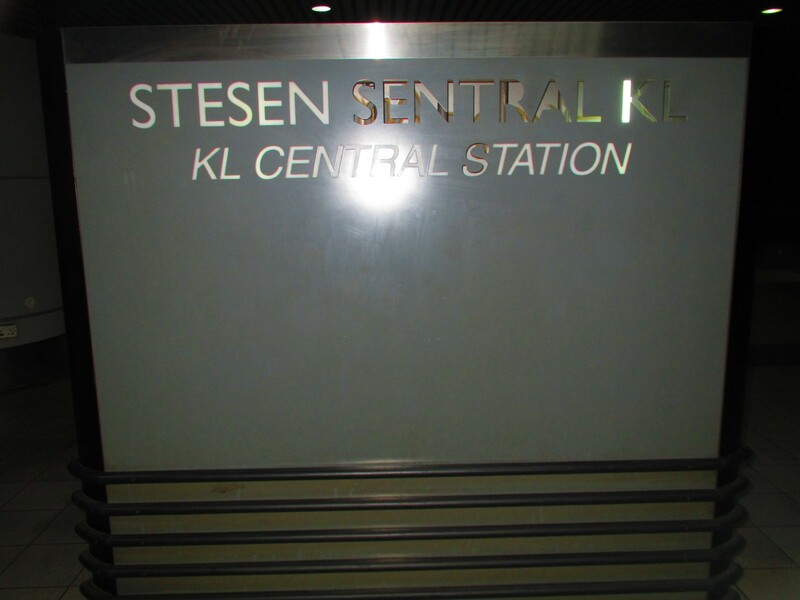 If you’re going to central KL, neither the train station or bus station is really in the centre, but you can quite cheaply and reasonably quickly get there. Whereas from the airport it’s a bit expensive by train to central KL, or slow by bus. So going to central KL I’d suggest the surface transport. 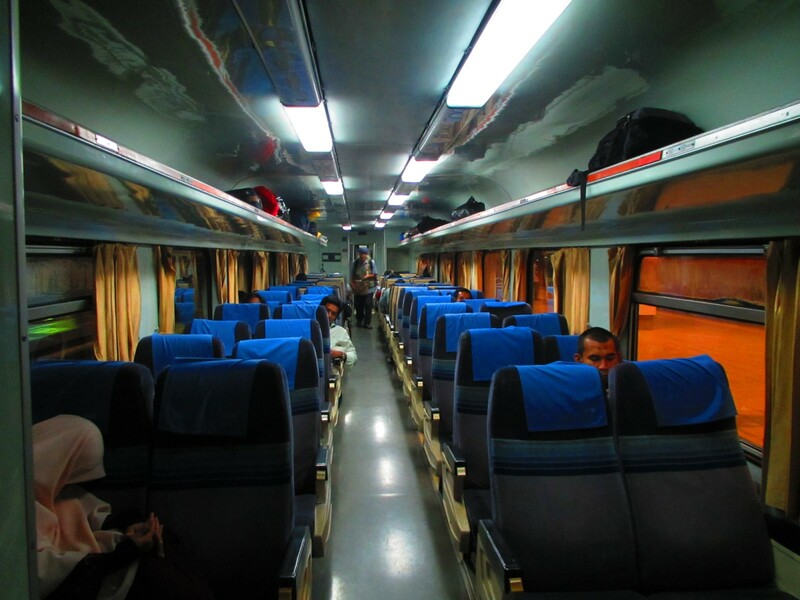 The train fare can be higher than many bus fares, but similar to the better bus companies. With a bus you might get WiFi, with the train you don’t, but there are working power points on the train for every two seats. The train is smoother and safer, and more comfortable, so that would be my choice, unless you want to save a few Ringgit by using a cheap and possibly not so safe bus company. So, to summarise, my idea is to fly between Penang and KL if you’re then flying out of KLIA, or vice versa; otherwise catch the train. 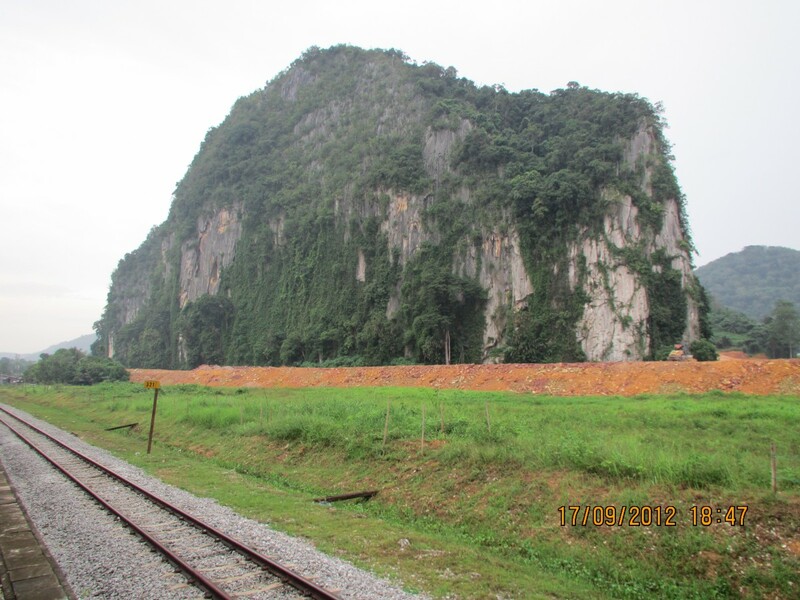 KUALA LIPIS: Keretapi Tanah Melayu Bhd (KTMB) is expected to close down its 321km Gemas-Gua Musang stretch along the east coast railway to conduct major track repair works soon. Land Public Transport Commission (SPAD) chairman Tan Sri Syed Hamid Albar said that despite its earlier notice to KTMB ordering its closure on Thursday, he expected KTMB to appeal the decision. 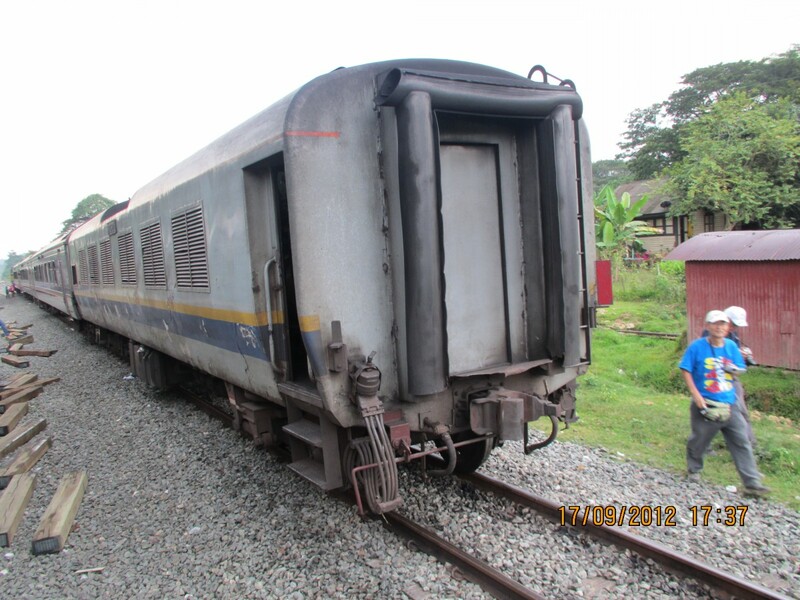 “We have noticed that KTMB has continued to operate despite such risky conditions,” he said. 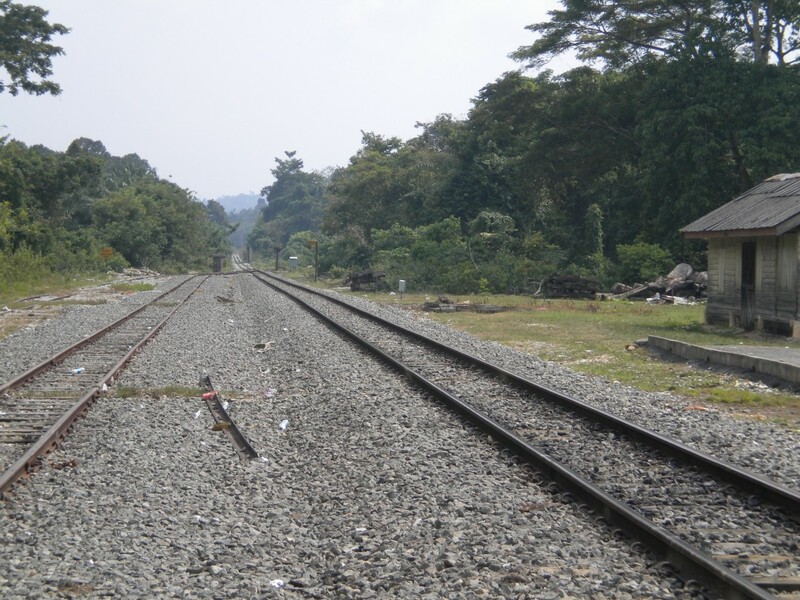 It was important to stop as the Government had approved RM400mil to im­­prove the current railway track, he said after conducting a joint inspection with KTMB president Datuk Elias Kadir and KTMB chairman Datuk Nawawi Ahmad, senior SPAD officials and KTMB staff along the stretch yesterday. The major track repair works involving 11 affected areas are expected to take up to two years to complete. 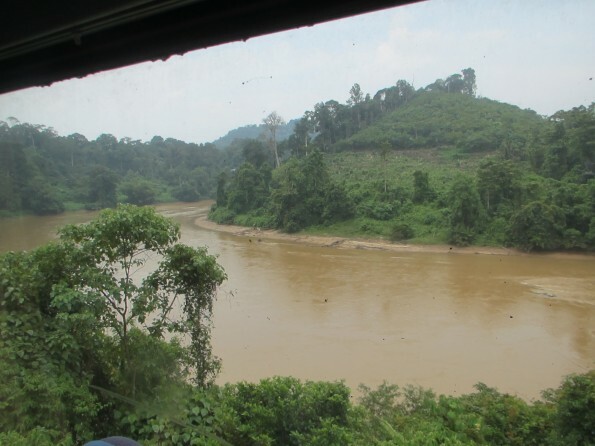 Among the affected parts along the stretch are railway bridges along Kuala Krai and Gua Musang in Kelantan, which face the problem of rotten wooden slippers, as well as soil subsidence and erosion affecting the tracks along Kuala Lipis and Jerantut in Pahang. It is learnt that 13 minor derailments have occurred on the railway line since 2012. Syed Hamid said while the notice issued was made in the interest of public safety, a final decision would not be made until KTMB had formally made their appeal. 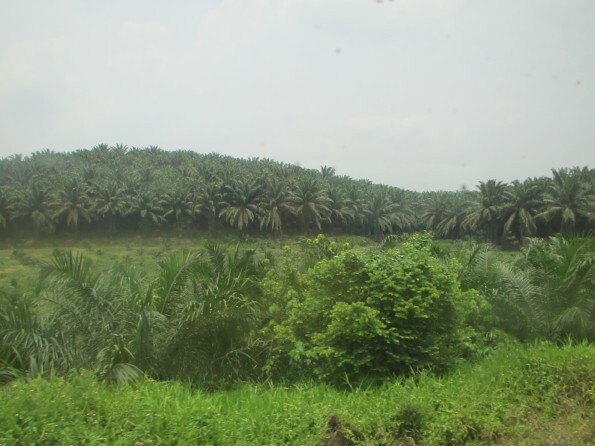 “We understand KTMB’s situation and their services are a real need. 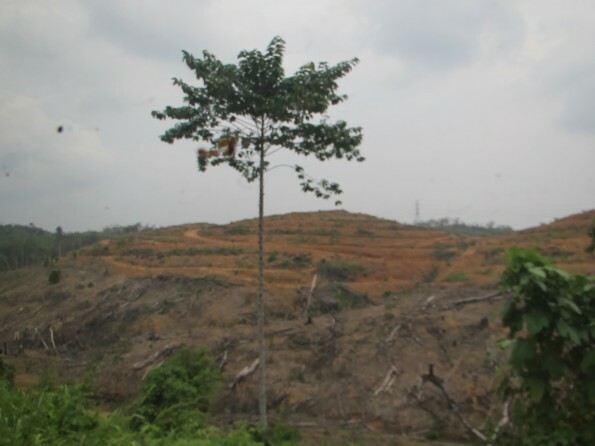 Therefore, their position must be improved from time to time,” he said. When asked whether the changes in the notice could affect those travelling during the upcoming Hari Raya season, he said the safety of the public remained the biggest priority. 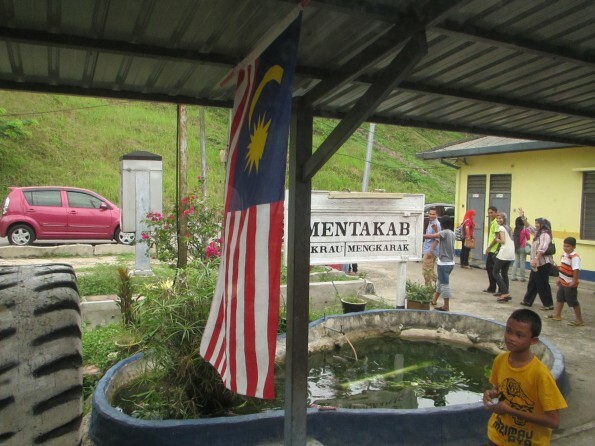 “We have suggested KTMB to provide alternatives as we do not want to risk a big tragedy during the balik kampung rush,” he said. 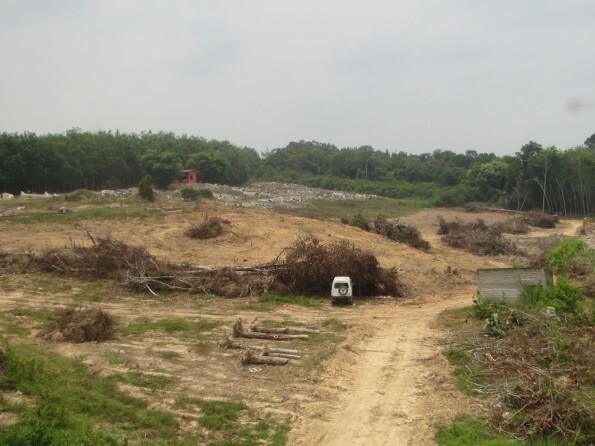 Admitting their financial shortcomings, Nawawi thanked the Government for approving the allocation, but hoped that SPAD would delay the closure notice. “We will discuss our appeal during the KTMB board of directors meeting on Thursday and will hand it over to SPAD soon. “While we are very concerned about the safety aspects of our passengers, we would also need time to adjust to the possible closure,” he said. 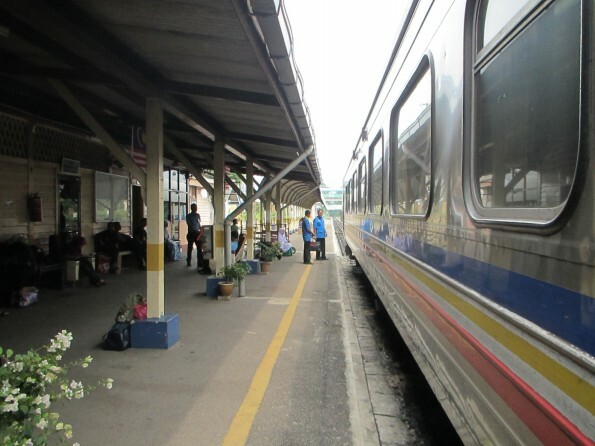 The plan was to catch a taxi from Malacca to Gemas, have breakfast if time, and then board the train for Wakaf Baru, the station near Kota Baru, where we would spend the night. There is only one day time train a day, and so if you wish to see the scenery you have no choice but to take it. It only has second class carriages. 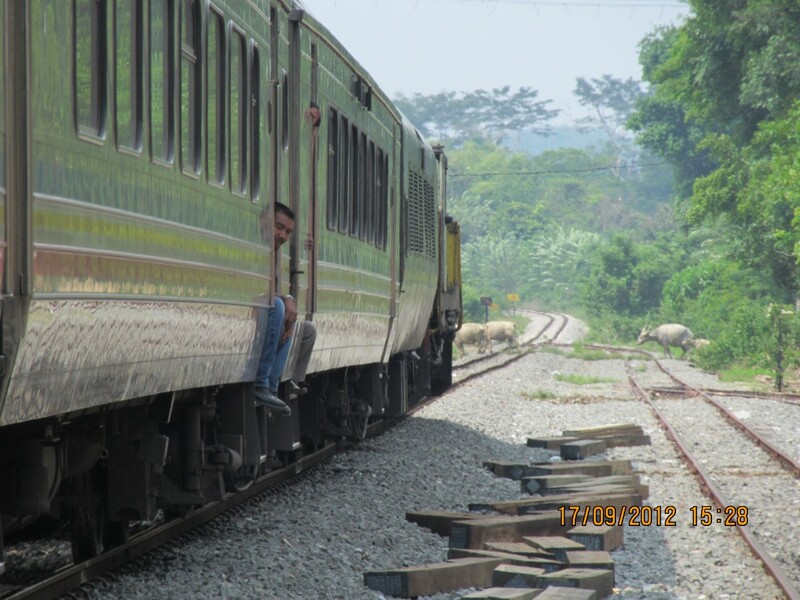 They are in worse condition than the west coast trains. 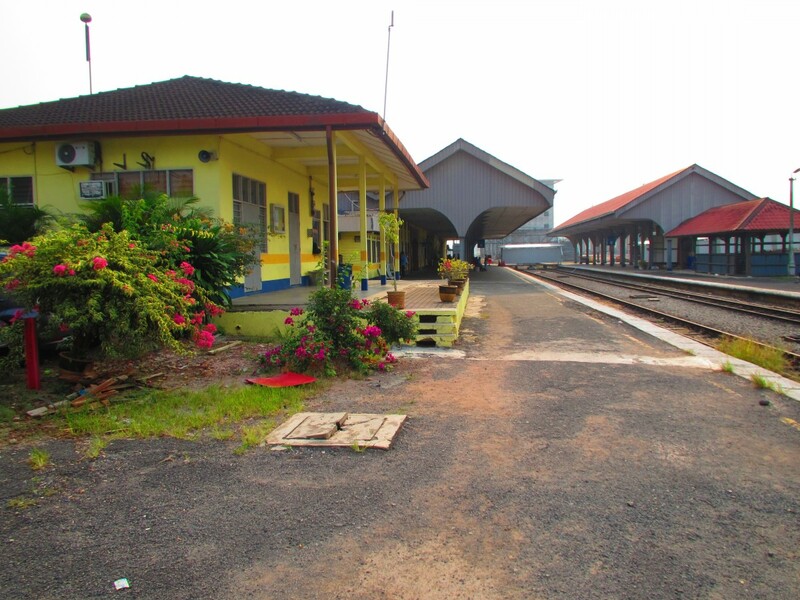 As there is no train line to Malacca, the branch line having been destroyed during World War 2, and having had no desire to spend the night in Gemas, we found ourselves having to catch a taxi early in the morning to Gemas Station. 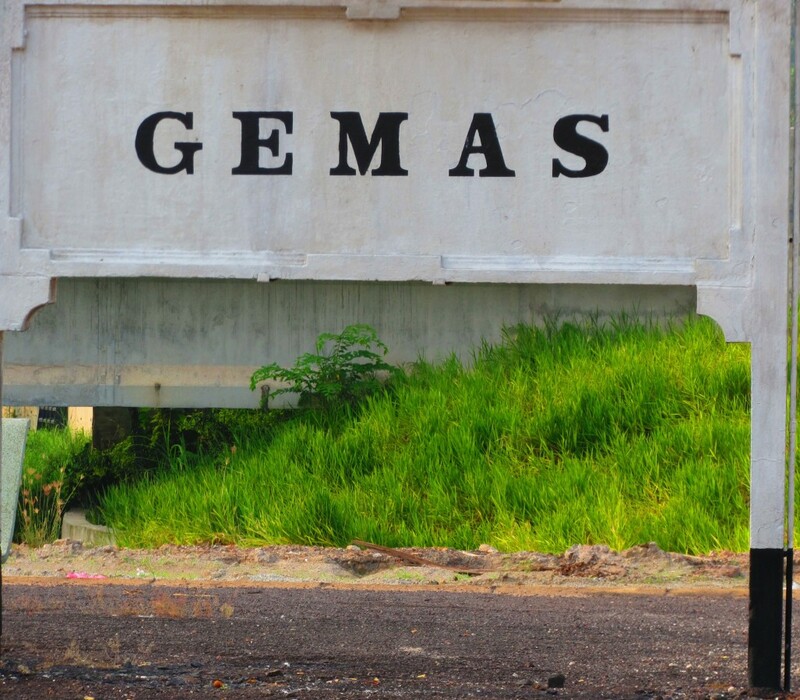 There may be a bus, but I wouldn’t reply on being able to get to Gemas on time for the train. And as the train comes from Singapore there is no good train connection from Kuala Lumpur to meet this train. 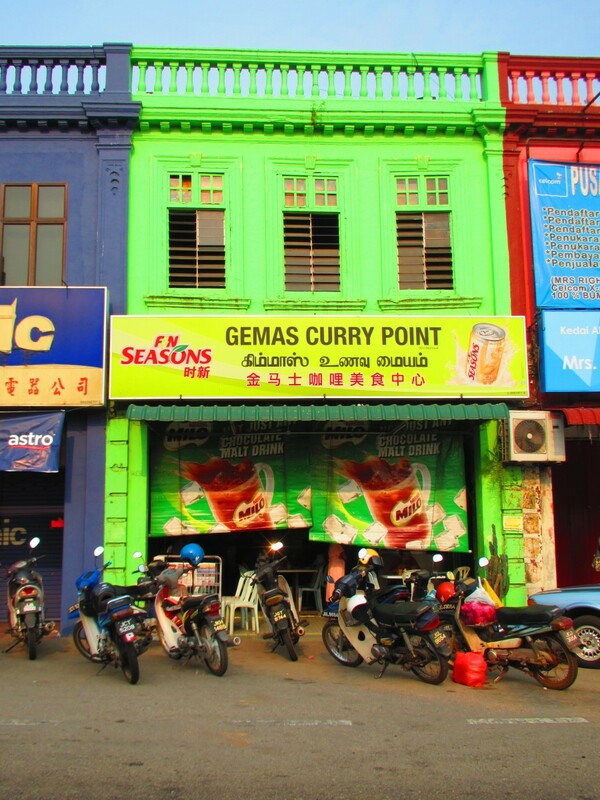 The taxi stand in Melaka Sentral quoted us RM140 to Gemas, and a driving time of up to two hours. 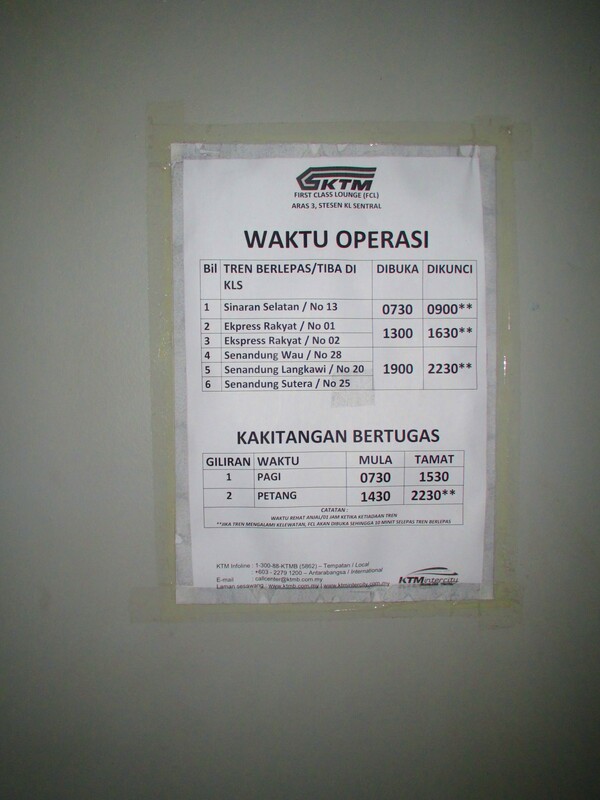 Train 14 to Kota Baru [Wakaf Baru] (EKSPRES SINARAN TIMUR 17-Sep-2012 09:38 17-Sep-2012 18:52) is scheduled to depart at 9.38 from Gemas. “Which station for Khota Bharu? 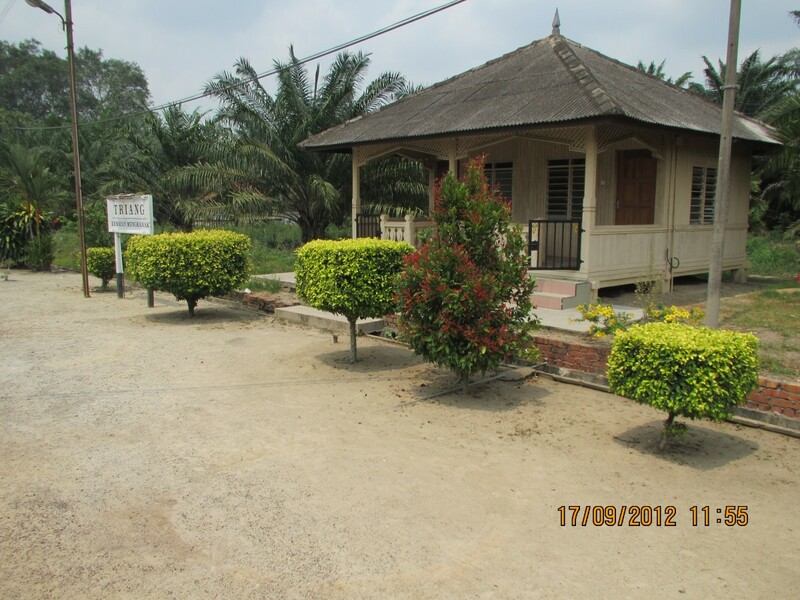 The closest station to Khota Bahru is Wakaf Bharu, about 5 km (3 miles) away. A taxi from Wakaf Bharu to Khota Bharu costs around 12 Ringgits. However, if you want to travel more cheaply by bus, there’s a better and more frequent bus service from Pasir Mas, 19km from Khota Bharu. Buses run from Pasir Mas to Khota Bahru every 15-20 minutes from 06:45 to 19:00 from a bus station just 100 metres from Pasir Mas railway station. If you want to complete the whole train journey to Tumpat, no problem, buses also link Tumpat with Khota Bharu every 45 minutes 06:45-19:30. Bus information for all these routes is at www.cityliner.com.my, select ‘Kelantan’ then ‘Khota Bharu’ as your location. 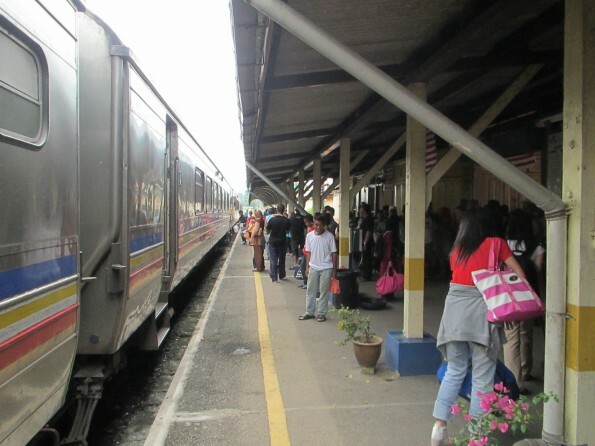 As most Malaysian trains do not have a dining car or even trolley service, we brought some food and water which we’d bought in Malacca the night before. 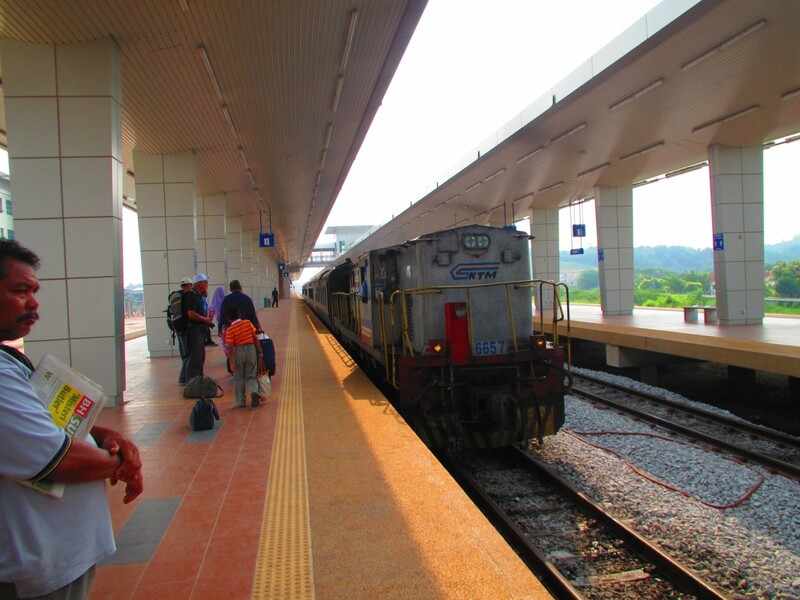 We booked a hotel in Kota Baru in advance as the train was scheduled to arrive around 7PM, which was a little late to be hunting around for a hotel. We had a taxi booked for 7AM, as we were told it could take up to two hours. 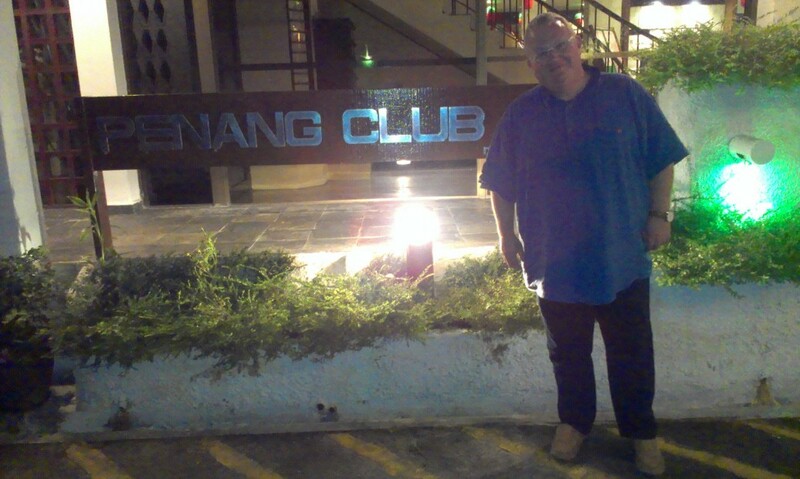 We were told the going rate was RM140, but were charged RM120 as the hotel managed a discount for us. As the traffic was light, it being a holiday, it took only one hour 20 minutes. 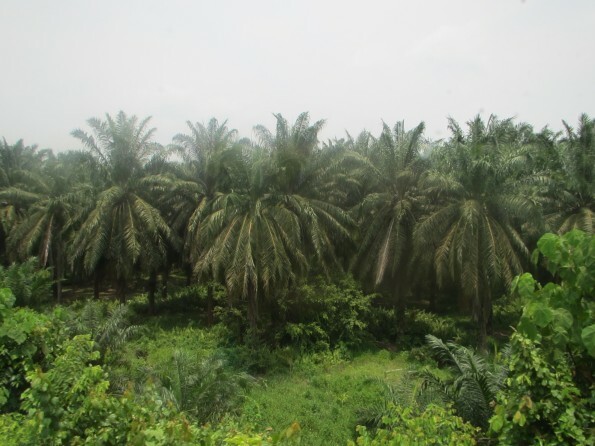 So we had over an hour to explore Gemas and the station, and to breakfast. Most of Gemas was still closed at 8.20, and there did not appear to be so much to see anyway, but The Curry Point was open, and busy. 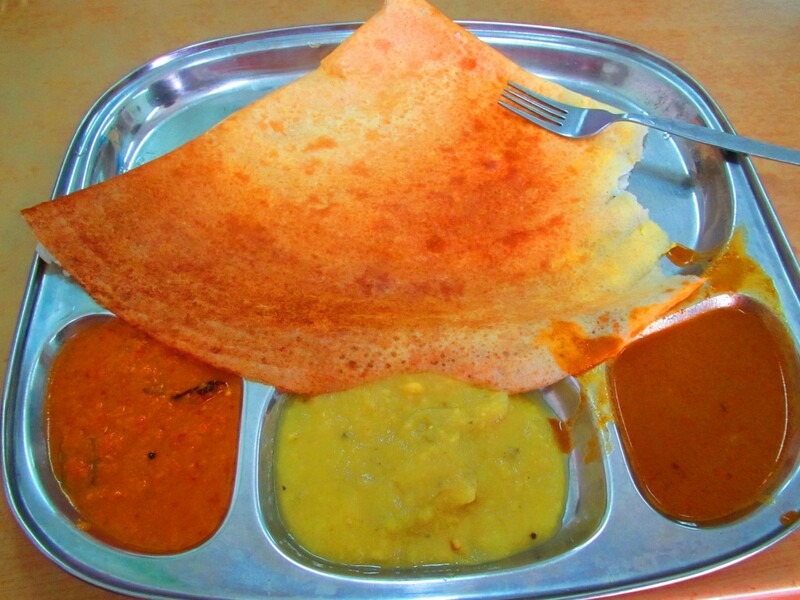 We asked for Dosa,and a cup of coffee each, and the dosa was delicious. Cost for both of us, RM5.80. Gemas station also has a cafe, but we were too full to even properly look in. It was open by 9AM, though. 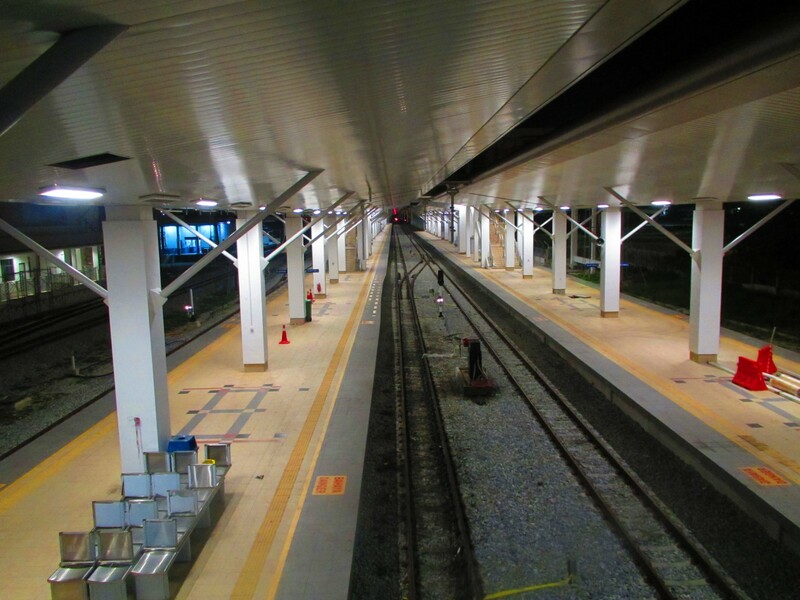 Gemas station has a new platform, but all prospective passengers waited on the old platform until the train was shunted in to the new one, and then the way was opened for us to enter the new platform and board the train. 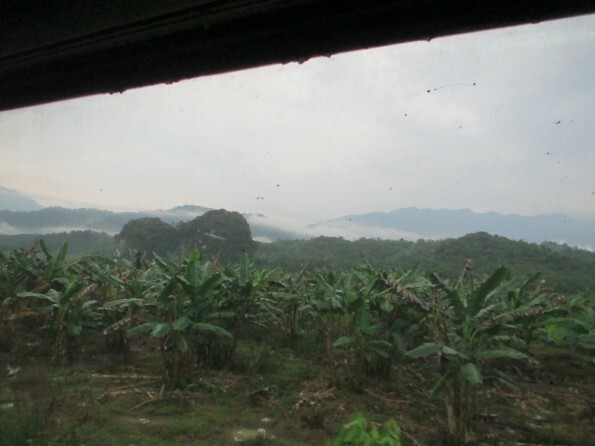 The main rail line is electrified, but the Jungle line uses diesel locomotives, so changing locomotives took time. The train was only three carriages long, and they were all second class. Not long after boarding the train it departed, at about 9.45AM. The point of this trip is to see the wonderful scenery. 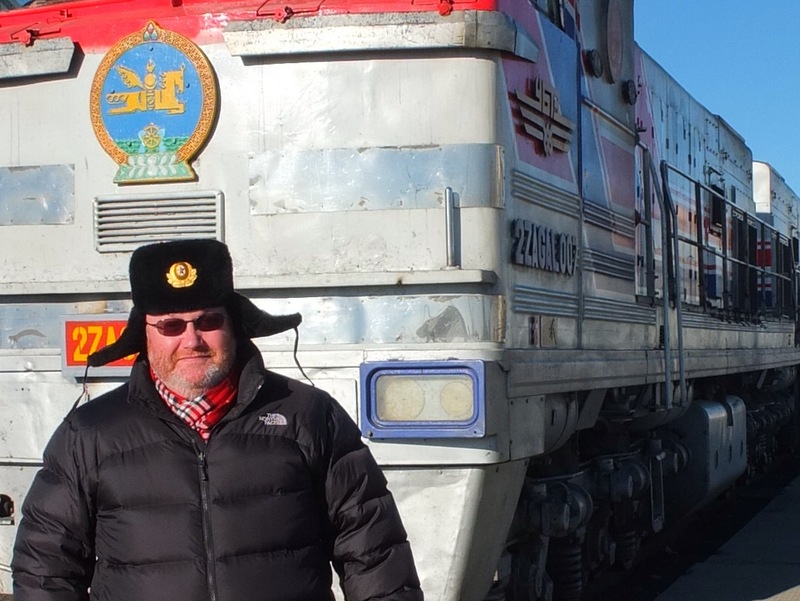 There is a report by a traveller on the The man in Seat 61 web page, which is what enticed me to make the trip in the first place. 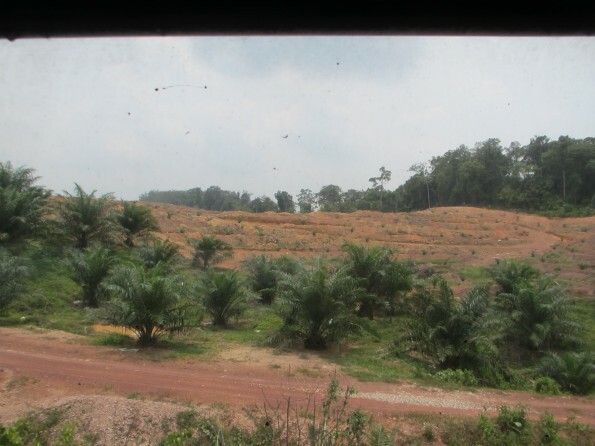 But as we continued to travel along the line, what we saw was mainly palm oil plantations, or land that was cleared, presumably for more palm oil plantations. 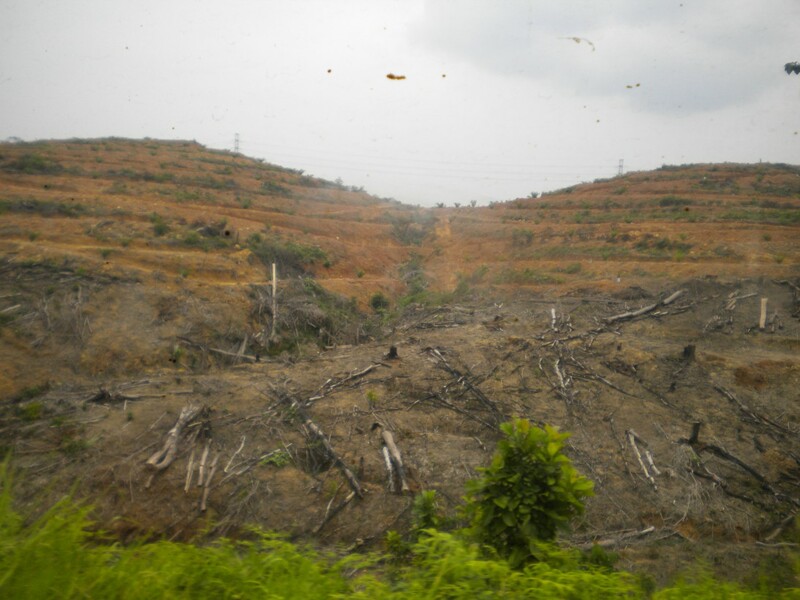 By 15.00 this had not changed, and we were still passing by the palm oil plantations or the devastated cleared land. This was disappointing. There was a trolley on the train with snacks and sweet drinks, but no actual food. It was wheeled through the train a couple of times, but was kept in the last carriage. We were happy we’d brought our own supplies. 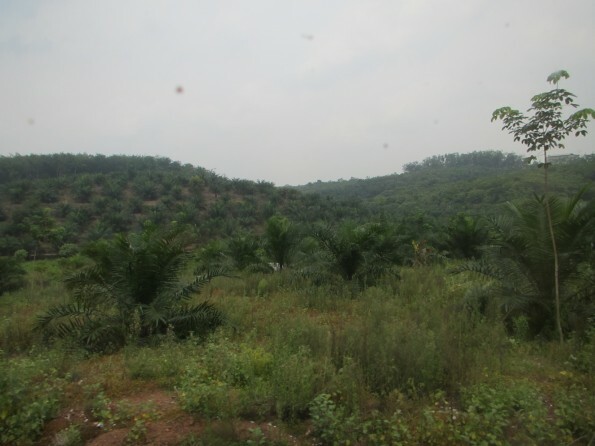 At around 15.15 we arrived at Chegar Perah, little suspecting that we would spend the next 2 1/2 hours there. Of course, it was not announced, and even if you ask the conductor you don’t get much of an answer. Apparently there was some breakdown somewhere up the line, and we were kept in a siding until other trains had passed. It is only a single line, with some sidings along the way for passing. 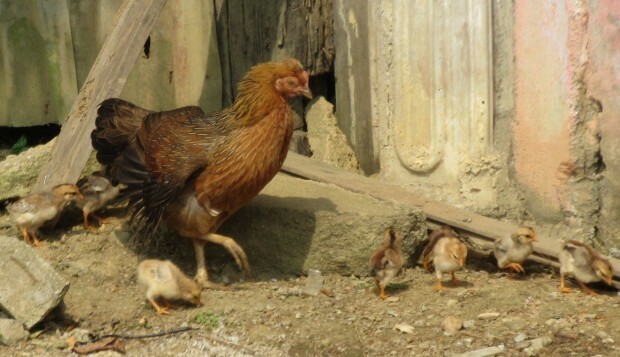 We amused ourselves watching the cows, goats and hens with their chicks wander past the train. 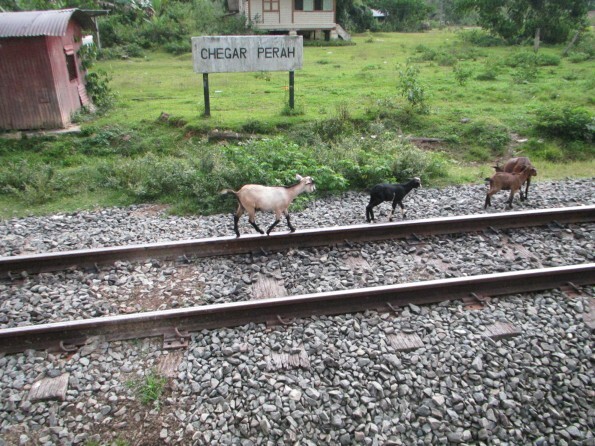 The goats could actually walk on the rails without falling off. We walked around the train. Looked at the cows. There was a shop we found, by watching other people go there, but it wasn’t selling any food or drinks we were interested in. We got too hot outside and sat in our seats, as the air conditioning was still on. A couple of trains went past in the opposite direction. We tried to sleep. Eventually around 17.40 the train moved off. And from now the scenery improved. 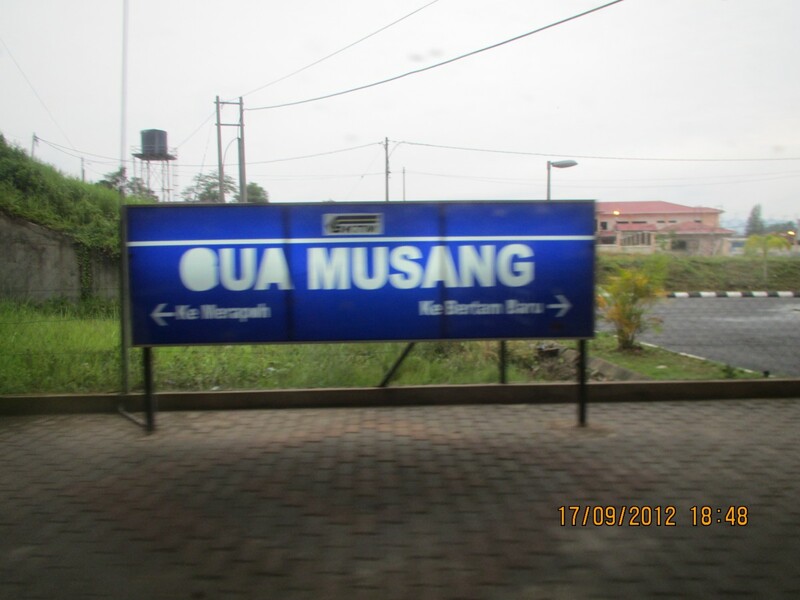 At 18.45 we arrived in Gua Musang, and the train shunted into a siding again, and we waited for perhaps 30 minutes while trains passed by going in the other direction. It seemed to us that the train controllers had decided our train’s punctuality was a total lost cause, so they might as well make us even later, and keep the trains going south on time. Of course, there was still absolutely no information from the conductor, the driver, or the train company as to what was happening. 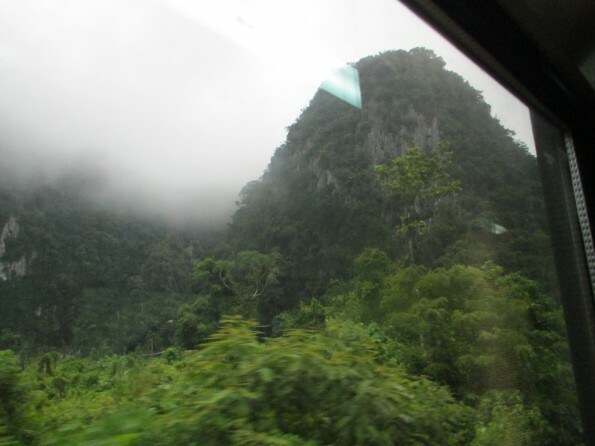 By now it was almost dark, so we knew we were not going to see the scenery we had ridden the train to see. Once we finally moved off it was dark and we couldn’t see anything. 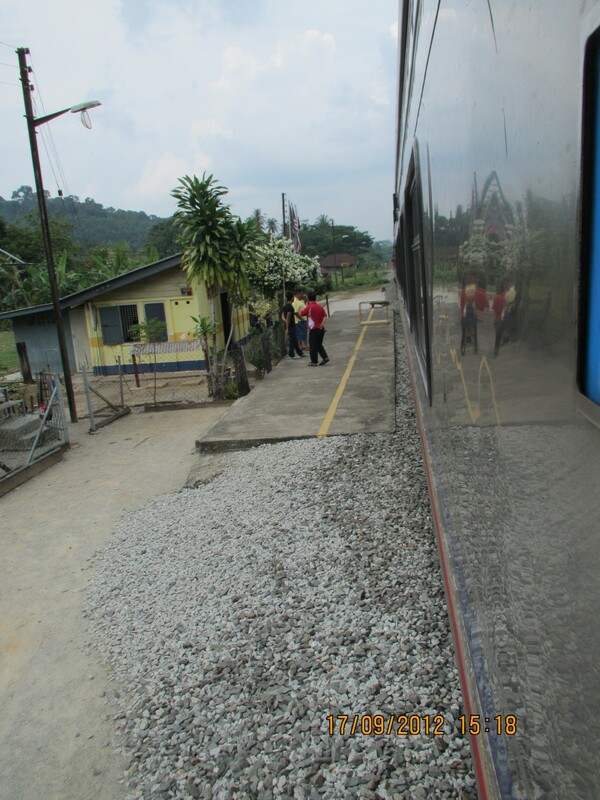 We stopped at Bukit Abu around 21.04 for about 10 minutes, and then at Kuala Krai at about 22.00, where we shunted again and went backwards and waited for a while. 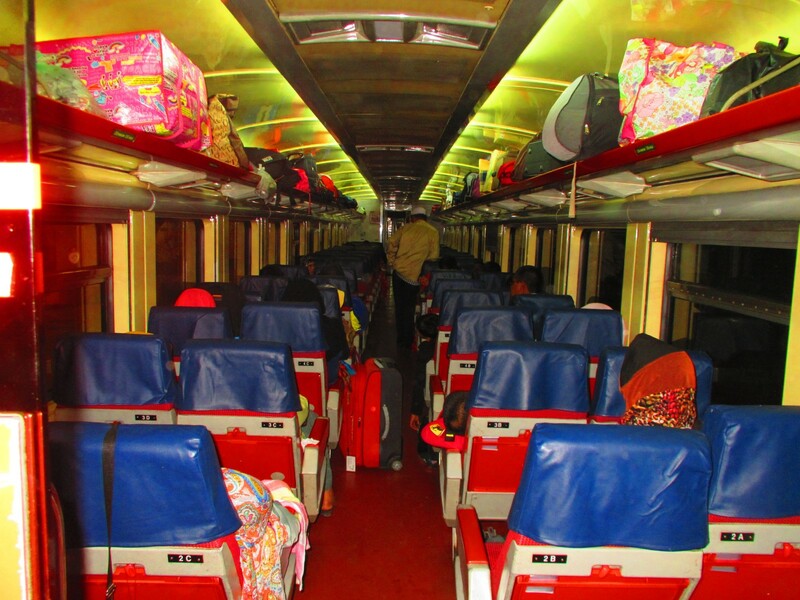 At last, around 23.50 we pulled into Wakaf Baru, five hours late, and with no apology or explanation from any of the train staff. The locals get picked up by their friends, but there were quite a lot of foreigners, who no doubt wanted taxis, and not many taxis, so we had to hurriedly agree to a fare of RM35 (which probably should have been RM20), for the 10 minute ride to our hotel, or wait perhaps half an hour until the taxis returned and try for a cheaper fare. It was the only time we were cheated on our trip. 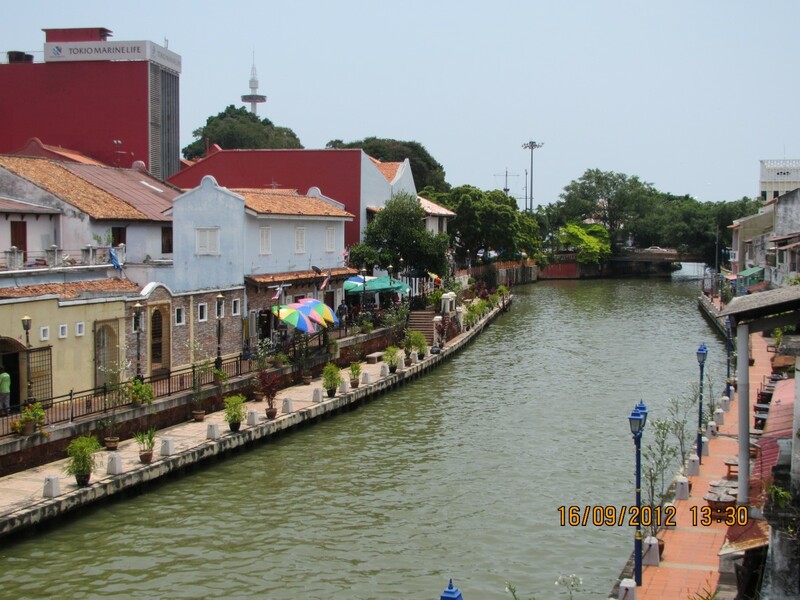 Malacca: River Song Residence, 100 Lorong Hang Jebat, Jonkers Street. This hotel/residence is inexpensive, new, clean, and has terraces right on the river, but the best thing is how friendly and helpful the management/staff are. We made a couple of requests, and they were 100% reliable. In the past I have usually stayed in the Equatorial, which is exponentially more expensive, and a totally different atmosphere, but nice. Kota Baru: Tune Hotel. I wanted to stay in one to see how it was. 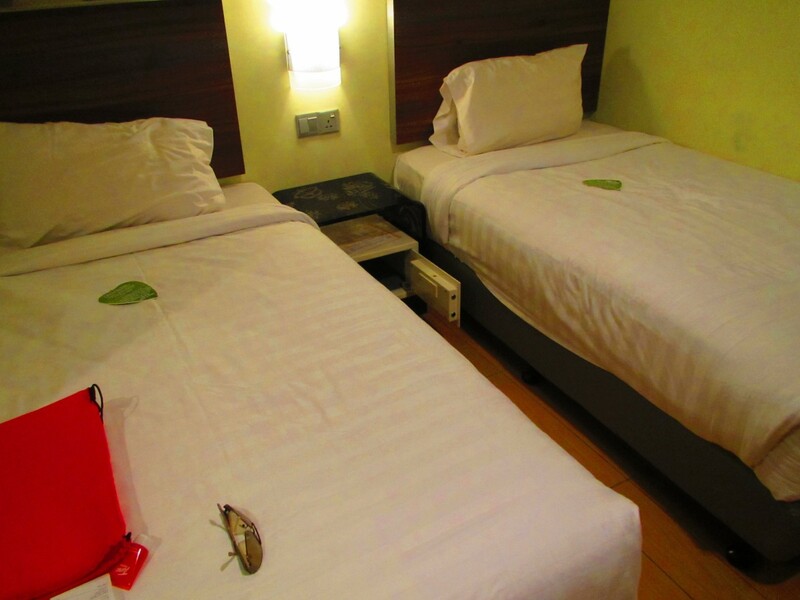 The staff were very friendly and helpful, and the rooms were surprisingly large for the image of the hotel. 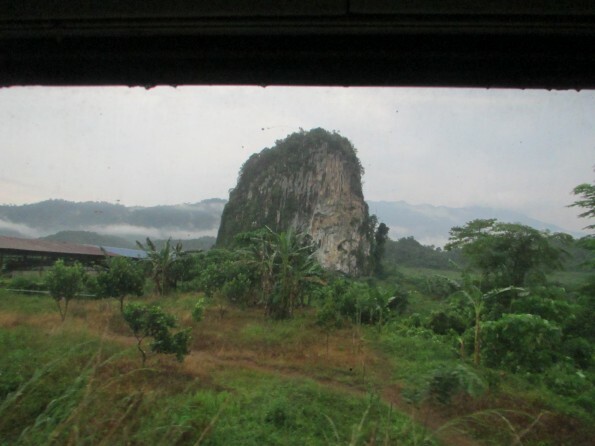 It appears the best scenery is probably from Chegar Perah to about Kuala Krai. As I missed seeing this due to it being dark I am thinking of taking the day train from Kota Baru next time, and then turning around and catching the train back to Kota Baru once I have seen the best part, or perhaps catching the 17.16 evening Intercity train and seeing most of it before it gets dark. There are other possibilities, too. 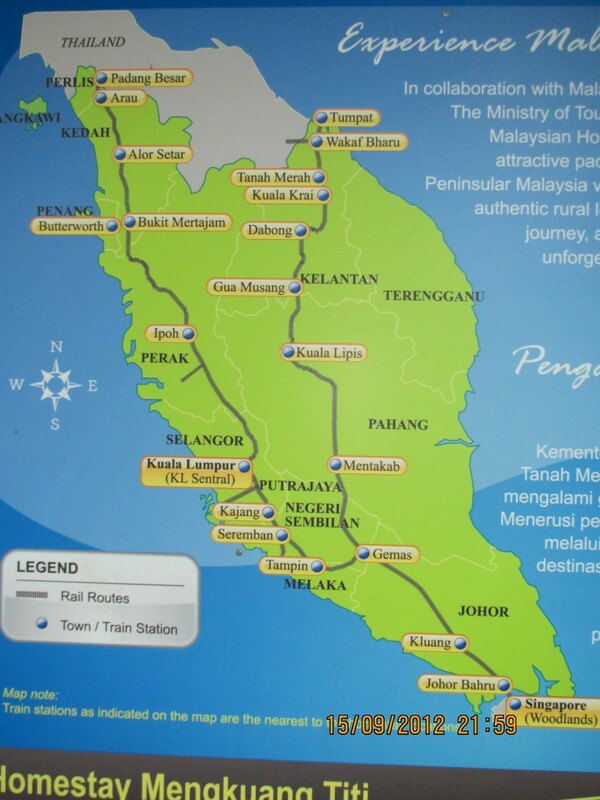 I made the booking, and I have just now made the trip, by ferry from George Town to Butterworth, and then the train to KL. The first thing I noticed is that the taxi fare to the terminal has gone up 33% after the government raised the petrol price about 10%. 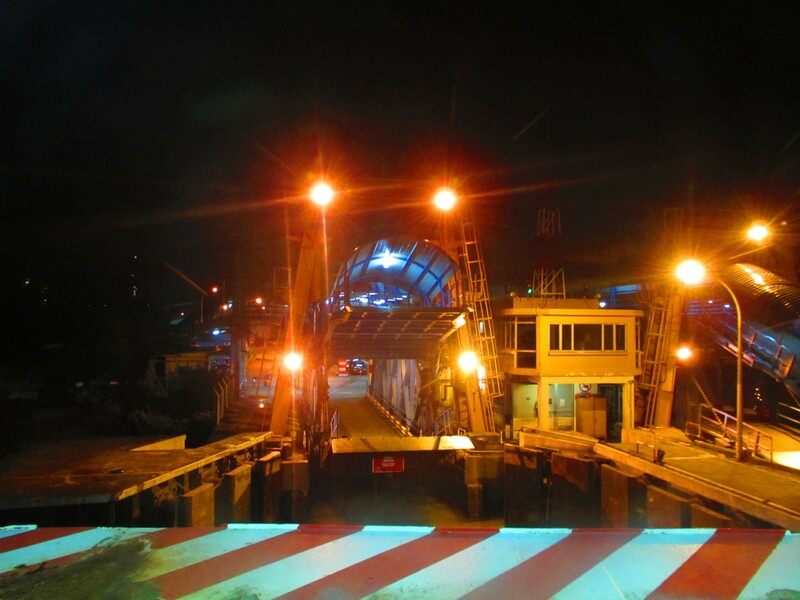 The next thing is that the Penang ferry terminal entrance is undergoing some construction work, and it is even less clear how to get to the ferry. 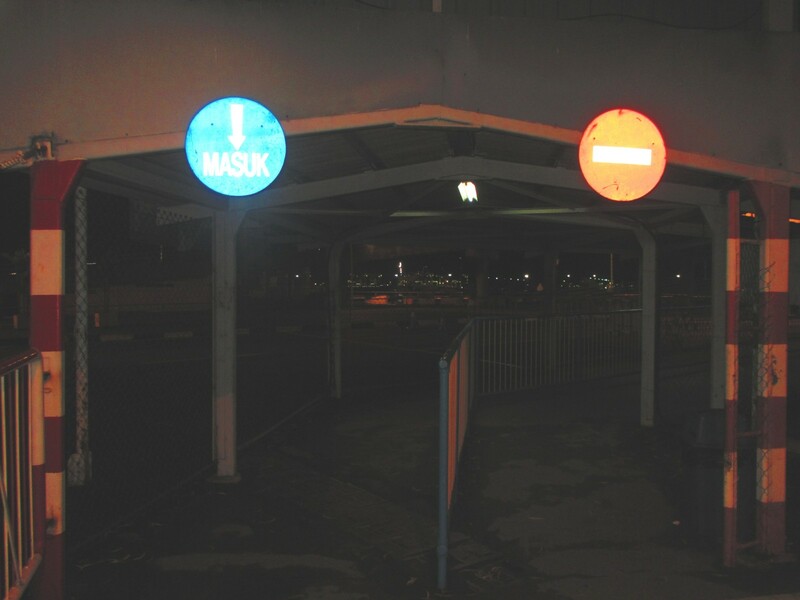 You just go straight in the direct of the water, past a few shops, following the path around to the left, and where the path divides, take the left side (where the sign says Masuk = entrance) up to the waiting area. At that time of night, the sign said there were four ferries operating, arriving at about every 15 or 20 minutes. 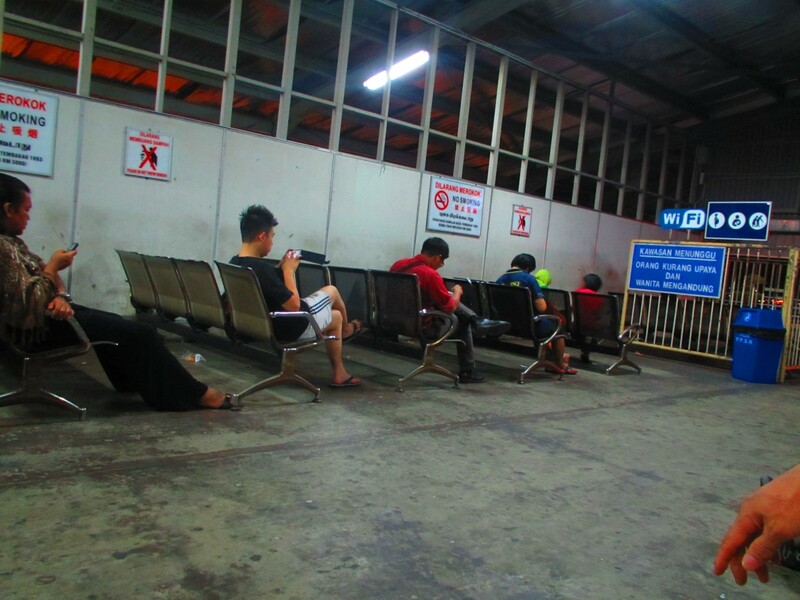 There is WiFi available – Penang Free WiFi, but otherwise it is an un-airconditioned, covered area with some seats. There is no WC. 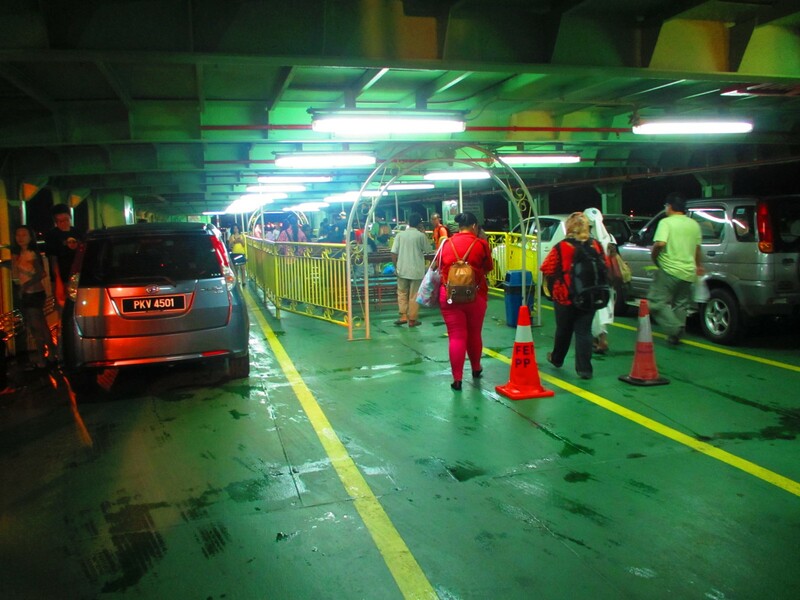 When the ferry arrives, the passengers disembark, the cars then drive off, the embarking cars drive onto the ferry, and then the passengers catching the ferry are allowed on. The trip across the water takes about 15 minutes, and passengers are allowed off as soon as the ferry arrives. It’s about five minutes walk to the station – go straight ahead, and turn right at the end – where the sign says – then follow the path. 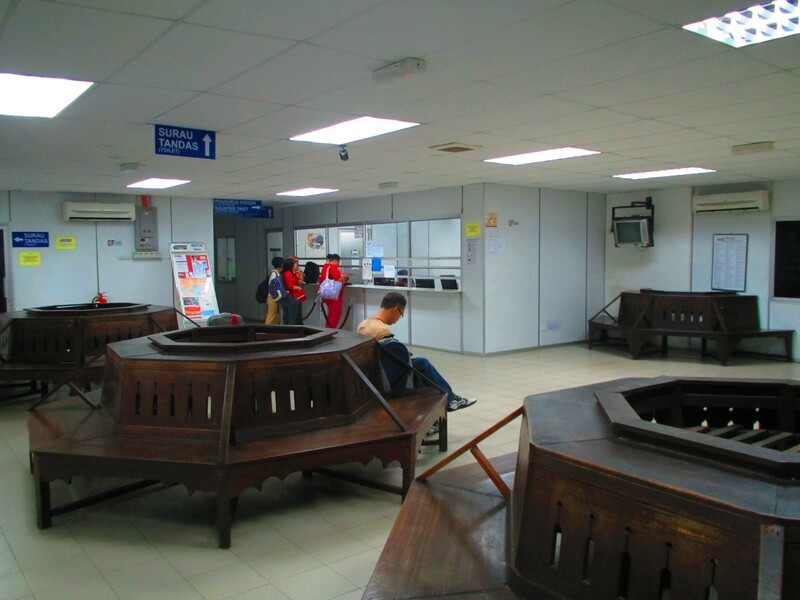 The station ticket office / waiting room is air-conditioned and clean. 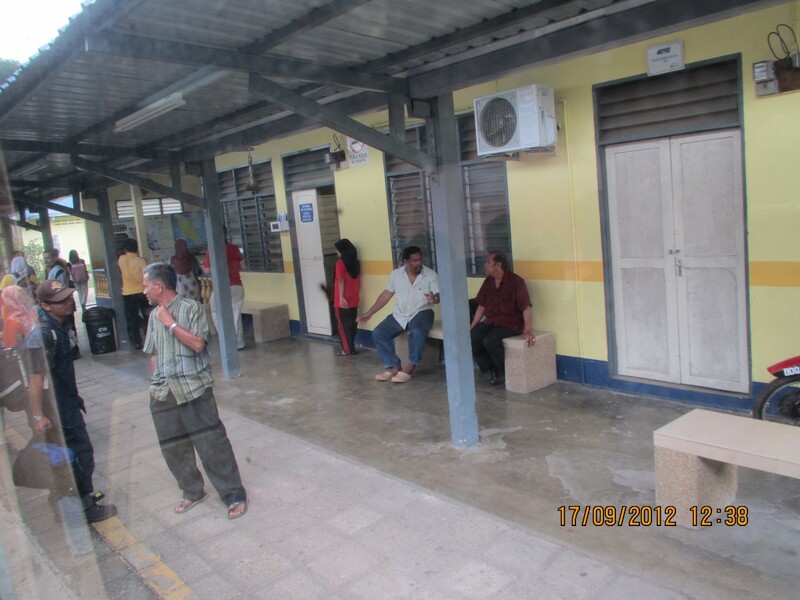 It had taken me about one hour from when I caught the taxi in Pulau Tikus to when I arrived at the station. The rest of the area around the ticket office is under construction. I went to the ticket window to find out how to get to the platform. They are using new platforms, not the ones next to the ticket office. I told the ticket office attendant which train I was on, and she told me the train was departing at 11PM. The web site, and ticket says 10.28, so I said to her that it was going to be late. She said that it arrives at 10.28, so it will not be late. Interesting definition of late. The toilet in this office is OK.
To reach the platform you have to return to under the stairs which brought you to the ticket office, and there is a track across the rails to the platform. The staff opens the gate about half an hour before the departure and you are free to board the train. As they are changing the station area I suggest you arrive in plenty of time to find the route to the platform. I had a look at the other carriages. Here are a few photos. I was in Coach L3 – which was easy enough to find, as the coaches are in order, and in Place 7A – which means Cabin 7, berth A. The quality of the facilities and service has deteriorated markedly. 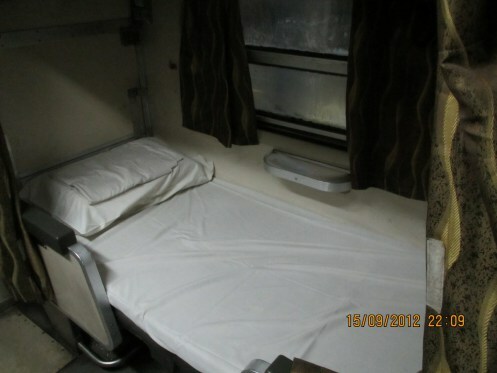 In the previous first class sleeper there was an attached bathroom, with shower, basin and toilet. In this cabin there is only a wash basin. Previously the berths were attached and parallel to the side of the train, but now the berths are across the compartment, so they are shorter and you can’t stretch. 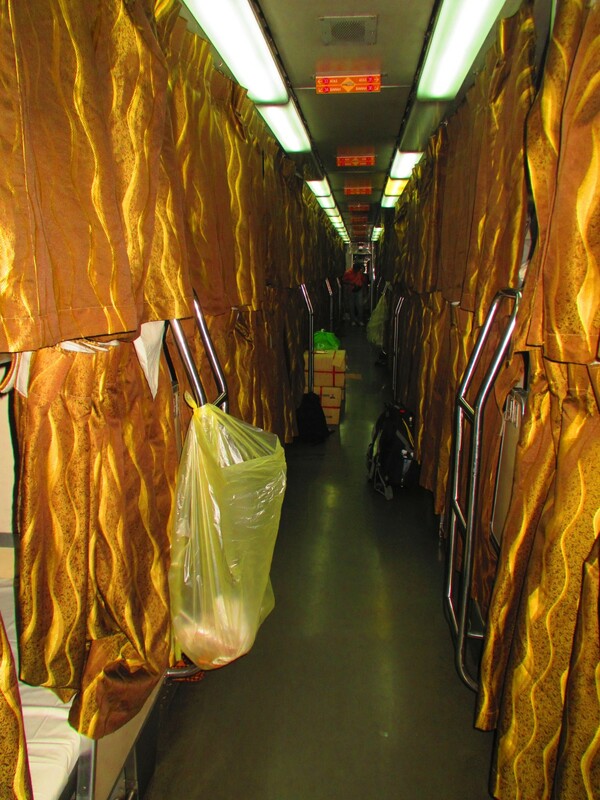 I think the carriage corridor is narrower as a result. 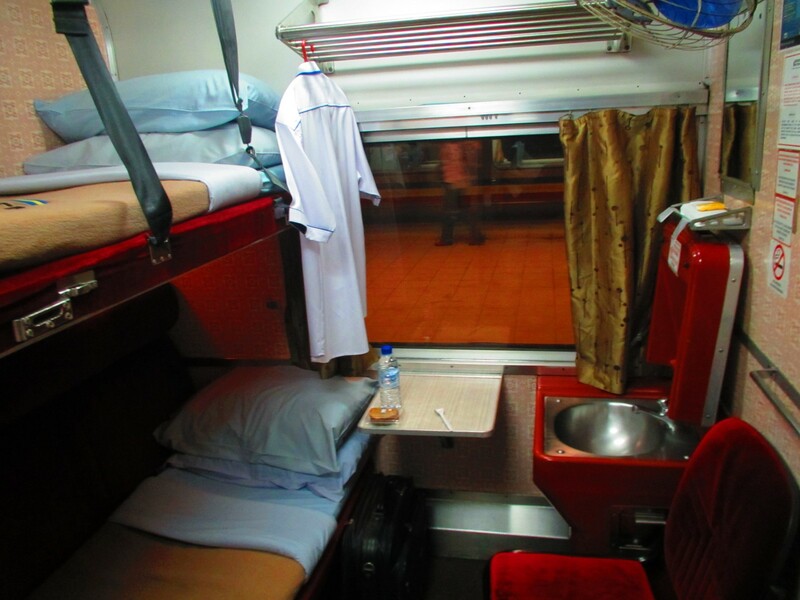 On the top berth your head is very near the luggage rack, so if the train had to brake suddenly your head would be hurt. If you remade the bed the other way it would be safer. I was pleased to discover there were two power points, as I wanted to recharge my phone, but disappointed that they didn’t work. Anyway, they are high up, so you need a long cord. You used to be given a 500ml bottle of water, and some more or less inedible food, but not any more. During the night it became cold and the blanket wasn’t enough. A jumper would be a good idea. The train departed at 11.15, it was a bit of a bumpy ride, and from around 5AM there were annoying but unintelligible announcements about the next stop. The train arrived on time!! At 6.30AM. 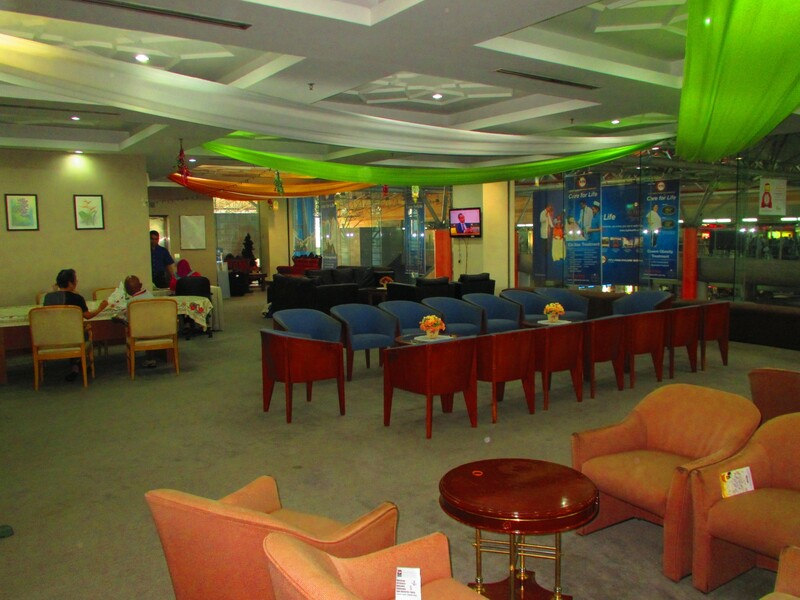 There is a lounge in KL Sentral railway station for first class passengers on the third level, very near the hawker centre. Previously I think it was always open, so I went there to clean up and charge my devices. But now it seems to open for an hour and a half before a train departure. I returned later when it was open. Now it is infested with cockroaches in both the bathroom and lounge, and some mosquitoes are around,too. There are showers on the bottom level, again with cockroaches. 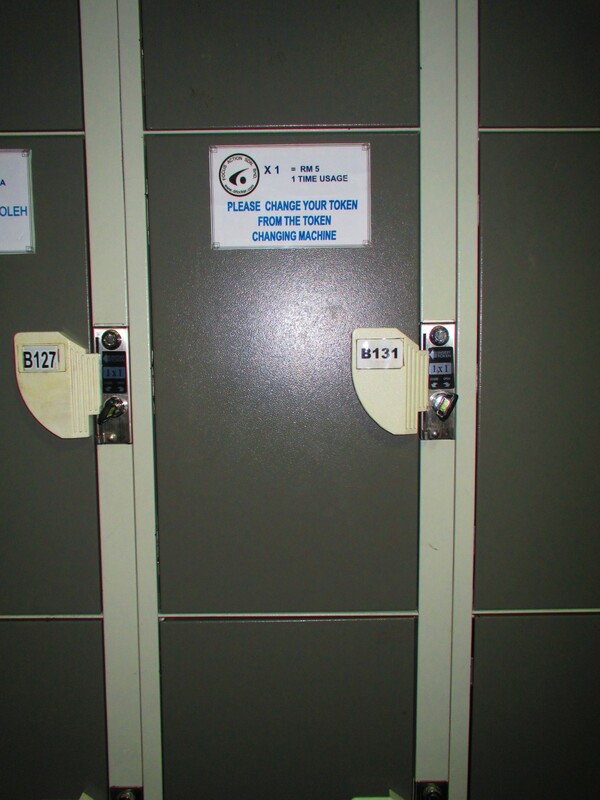 And nearby, lockers, the smallest and cheapest being RM5. I went to the ticket office on the second level to book a return journey,but the train was completely booked for the next five days. So, early booking is advisable. 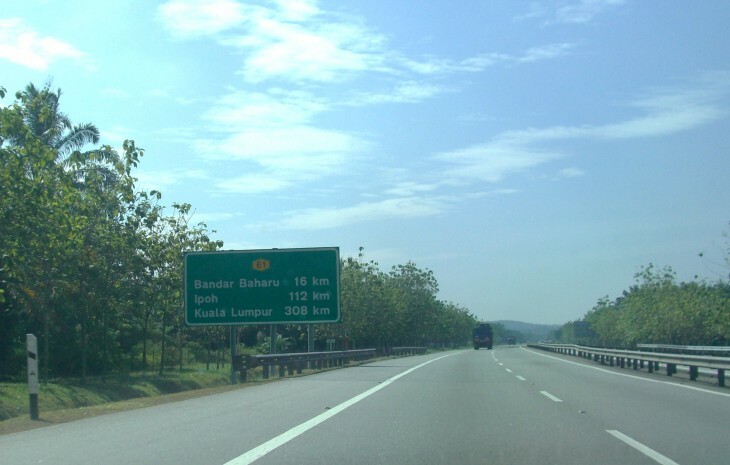 If you can get a booking – book early – it is still a reasonable way to travel from Penang to KL, as you save a day travelling by night, and save a night’s hotel costs. It is now worse than in the past, but still OK and quite comfortable. But, ensure you use the toilet in the station before you board. Take something to drink onboard, but don’t drink any more than necessary because you really don’t want to use the toilet onboard if you can avoid it. Have something warm with you, like a jumper. And for safety consider sleeping with your head in the other direction. Once the line is electrified it should be a much faster trip, and I don’t know if they will still provide a sleeper service. If they do, I hope they have new rolling stock. You can see more photos on my older blog on the night train.